This is a typical Portuguese recipe with fresh cod and olive oil. Lagareiro is the name in Portuguese for the owner of an olive press. It is a simple and colorful dish that will enchant your guests with its lightness and flavors. 2. 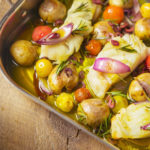 Place the cod fillets in an ovenproof dish. Season with salt and pepper to taste. Top the fish fillets with the garlic cloves, the bay leaf, the rosemary, the red onion and the cherry tomatoes. Drizzle with olive oil. 3. Leave the skin on the potatoes and wash them thoroughly. Arrange them on a baking sheet, drizzle with olive oil and sprinkle with salt. 4. Place both the potatoes and the fish dish in the oven. Let the cod cook for 20 minutes and the potatoes cook for 40 minutes. 5. Add the potatoes to the cod dish, put it back in the oven 5 minutes.